With our fleet of heavy-duty and super-duty tow trucks, Mobile Maintenance & Towing hauls commercial lines of semis, tractor/trailer combos, and comes to the rescue with roadside assistance and maintenance. Serving Tucson for over a decade, MM&T offers round-the-clock, day and night towing service. In that time, we’ve earned a solid reputation from commercial freighters and commuters alike. And we aren’t just a towing service. We provide a team of quality mobile mechanics, road side assistance technicians, and towing of all loads and sizes. Our heavy-duty and super-duty semi towing rigs come with unrivaled torque, performance, and efficiency. Our super-duty tow trucks handle up to 17,000 pounds unrivaled sets us apart from the rest of the competition. Stabilizing outriggers for uprighting and lifting heavy loads. If your fleet needs a lift to our shop, we go the extra mile with free towing to our shop for large repairs. We also offer scheduled maintenance for commercial fleets to make sure your business runs like the well oiled machines it depends upon. At MM&T, We understand that commercial fleets are the backbone of your company. In order to make sure your lines of freighters move like clock-work, we offer scheduled maintenance, free towing to our shops for larger repairs, and more. When accidents happen to one of your big rigs, go with the most reliable tow trucks in Tucson for recoveries, roll-overs, or break downs. Our fleet of heavy lifting tow trucks can get to your rig in under half an hour, and time, day or night. And with our mobile maintenance services, we can have a technician inspect your tanker onsite. Contact Us for the Heaving Lifting! 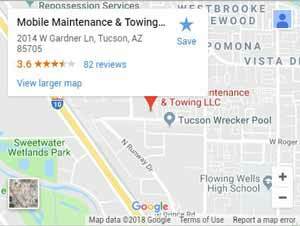 Ten years and running, our reputation of 24-hour towing, mobile maintenance, and roadside assistance has grown throughout Tucson. Our fleet of light-duty to super-duty tow trucks deliver you and your vehicles to our shop or elsewhere.